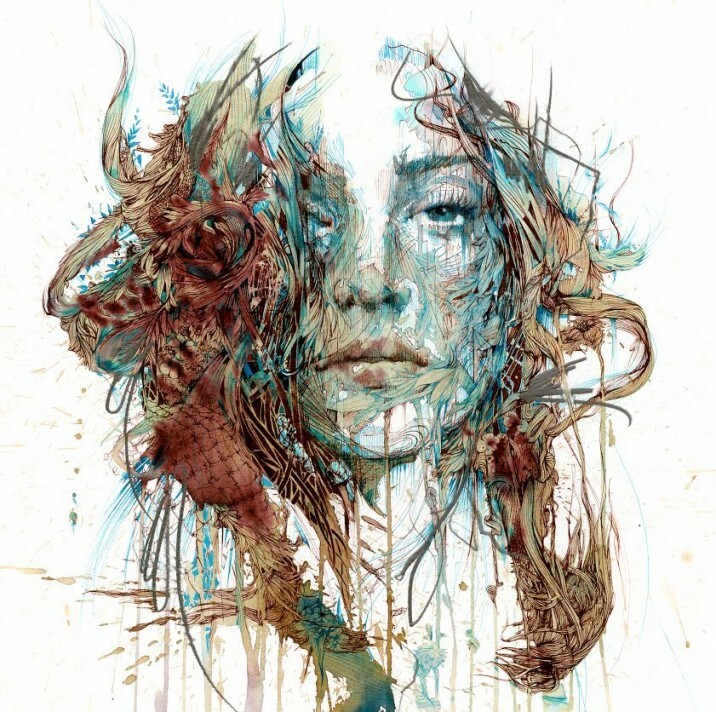 In the latest instalment of our 'Artist Spotlight' series ACS artist Carne Griffiths discusses the use of ink, tea and alcohol in his meditative drawing practice, and how a background in embroidery design has influenced his visual language. I like to work with an array of unusual liquids. My work is a blend of studied detail mixed with the spontaneous and chaotic. I use mainly a fountain pen and calligraphy inks which I then attack with various teas and alcohols usually thrown from the brush or sometimes with boiling water direct from the kettle. I like the freedom and energy this approach brings to work and the uncertainty of outcome is definitely something which is key to my whole working process. I have a strong interest also in the automatic processes and consider my work to be meditation, normally around the topic of our relationship with nature. My inspiration and drive come from a combination of outer and inner experiences. I like my work to be a positive focus, and to draw attention to the beauty in simplicity, for it to have a calming effect and return focus to the natural world and therefore I draw much influence from nature itself but also our representations of nature in graphics, textiles, interior design, film and painting. I was an embroidery designer for 12 years before working as an artist so this stylistic influence has great bearing on my work, not necessarily by choice but it has formed a visual language for me. My usual working process involves reaching a meditative state through drawing – I focus mainly on portraiture work and my subjects and reference come from either found sources, collaborations with photographers or an amalgamation of images. The most important thing for me is that I begin with an emotional response, there has to be some kind of fire created from this starting image it has to be emotionally charged in some way so that I can take that energy and focus it towards nature. I will start usually with graphite and then calligraphy ink – working quickly and without too much consideration to creating likeness or reproducing an image, the feel of the work is most important in the initial stages and it is at this point that I employ some kind of interplay with liquids whether it be poured thrown or dripped through the work, I rarely at this stage bring brush into contact with the work but use flowing actions and strokes to launch the liquids onto the page. I can then wait for several hours for this to dry and for patterns and shapes to emerge from the mix of inks and liquids, this begins to create the story of the work and I use these accidental marks and gestures to shape where the natural forms will blend with the work. From this point onward I use no reference at all and I like to lose myself in the work, I will usually listen to music and try to meditate on the subject of the painting – all imagery comes from making simple marks and allowing shapes to appear on the page, based on my own library of floral shapes and patterns. The first piece I painted was a piece called the Harvest – it was a freehand drawing with no reference and I painted it using calligraphy inks and brandy mixed with plain water washes, it depicted a man plucking foliage from the ground dressed in a long flowing fish scale shawl, I consider it to be a piece that was drawing together all my influences at the time and making preparation for what I was doing next – at the time it was unconsidered and free flowing but looking back I think it says a lot about the start of a new journey and the transition I was making from embroidery designer to fine artist.